I made it through my first year as a professor. And here I sit, a year later and a lot of knowledge gained. I feel like for all the experiences and growth I’ve gained in the past four years since I graduated college, this year has taken the cake. New job, new house, new singlehood, it’s really a lot to take in. 2. Relaxed with a big pot of coffee and watched the sun rise while grading a few papers. 5. Attended meetings, rehearsals, and spoke with students about life. Sometimes I forget how lucky I am and how much I really do love my life for the small things. I spend a lot of time comparing myself to others (which I try so hard not to do, but with the internet it’s damn impossible.) My life is far from perfect but I do things that make me happy and in the end, that’s all that matter. More and more I remind myself that happiness is what I need to follow, to pursue. Take these enchiladas as another example of things that make me happy. I don’t think I would have made these for anyone else because I could have only imagined their reaction (something along the lines of rhubarb and enchiladas? What?) I’m stepping out with recipes that I’m not sure how people will react (like radishes on pizzas.) So today, I give you rhubarb on enchiladas. 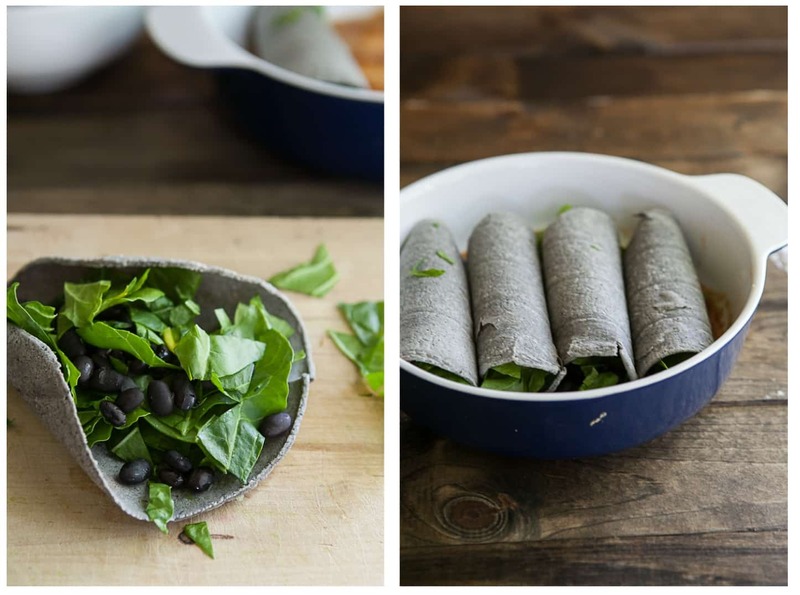 A couple notes: I used blue corn tortillas because that’s what I have in my refrigerator. You are can also use regular corn tortillas or even wheat tortillas. Also, the filling is so simple that you could play around with it (maybe sub spinach or kale for the swiss chard.) Really what makes these special is the rhubarb! In a larger pot, heat olive oil over medium. Add in onions and saute until the onions become translucent, 4-5 minutes. 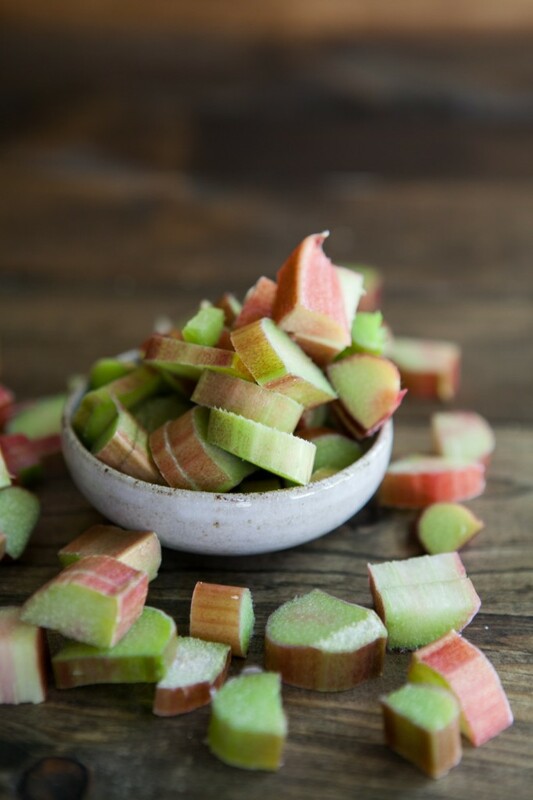 Stir in rhubarb and continue to cook until rhubarb begins to soften, 3-4 minutes. For filling, heat lime juice in a skillet over medium-low. Add in garlic and cook for 1 minute. Stir in beans and salt, cooking until beans are hot. Remove the swiss chard stem and shred greens. Stir in to beans and cook for one minute. Chard should barely be starting to wilt. 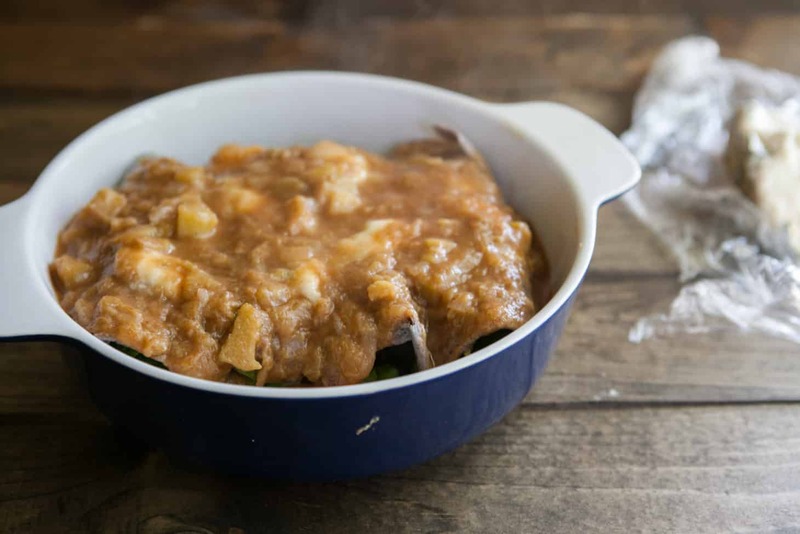 To assemble enchiladas, spread 1/4 cup the rhubarb sauce in the bottom of an 8×8 pan (or something similar.) Have a warm water bath ready and dip each corn tortilla in the water (or you can dip it in the sauce as well) for 10-15 seconds. Remove and fill with bean mixture then carefully roll. Place seem side down in pan. Repeat with the remaining corn tortillas. I choose to only put cheese on top, but you can also toss cheese in each shell. Add desired amount of cheese on top and cover with remaining rhubarb sauce. Bake for 20-25 minutes. Cheese should be melted and rhubarb sauce should be bubbling. These look so healthy! I love this idea! I really love the idea of combining rhubarb with something savoury, I’ve been kicking around the idea of rhubarb and chilli recently so I’m totally on board with this. I’ve been waiting for this post! The sauce sounds incredibly creative and tasty! I am loving all your savory rhubarb recipes. I have such a sweet tooth I always find myself baking new things instead of cooking. I think this is a great idea! Rhubarb has a similar sourness to tomatillos, so using rhubarb as a sauce on enchiladas makes a lot of sense 🙂 I love it! I very much agree. It is so difficult not to compare oneself. I really struggle with not feeling “good enough.” I am trying very hard to stop any self-defeating talk and am slowly make head-way. Congrats on the huge accomplishment, Erin! I think we can often forget how great our own lives are, when we’re constantly watching the world around us (and isn’t it so easy with all the media flying at us from all directions??) I love using rhubarb in savory dishes (I actually just finished working on a dish with a rhubarb sauce that will be up on the site in a few weeks). I make tacos all the time, but never enchiladas. Weird! I need to make this asap. Also, I love Fleet Foxes! Congratulations on your first year as a professor! 🙂 Wish I had a professor who also took time to plant a garden with her students and teach them how to cook on the side! What a great idea. I’m getting tired of seeing all these rhubarb tart and crumbles, because I’ve just about had my fill of sweet rhubarb dishes. I try to pack in as much rhubarb as I can while it’s in season, but sometimes it results in too many desserts. This looks like the perfect recipe for savory rhubarb. I’m heading to the Mexican store today (only place in Zürich where you can find blackbeans and good corn tortillas) so I will definitely stock up on the ingredients and try this out on Saturday, after we’ve gotten some rhubarb from the farmer’s market. I love the small things too, they are what make me me. I am definitely guilty of comparing myself with others, but it is in those quiet (computer-less) moments that I find I am truly happy. Kudos on your accomplishments! These look good and I like the sound of the rhubarb sauce! This looks amazingly delicious! I can’t wait to try ALL of your recipes! I made this last week and had it for lunch three days in a row – not a disappointment! The only sad thing is that rhubarb season is so short. The filling looked a little skimpy when I read the recipe, so I doubled my crockpot-cooked black beans and Kale. I also didn’t have any chipotle, so I used a mix of cumin, paprika, and chili powder. With a little feta on top it was perfect! For meat eaters out there, chicken tastes great with this. 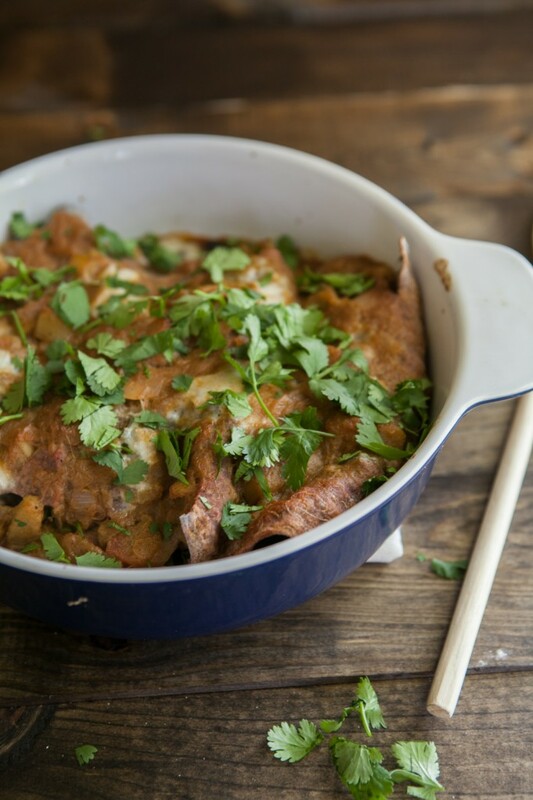 It perfectly balances the softness and tartness of the enchiladas.